Another sell off in the markets based on fears from Drumpf damaging economy of the US by escalating the trade war, job report, inflation fear. But we may be bottoming. Although if we really are, the road to recovery still may be very bumpy. 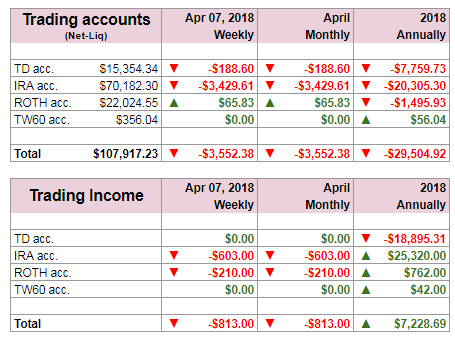 The first week of April wasn’t as great as I would wish, we rolled a few trades and the overall trade balance was negative. In March we made way over &18,000 dollars income so a small loss of around $800 dollars the first week in April is not dramatic. It still can turn around by the end of the month. The net-liq was damaged quite a lot due to sell offs. In our IRA account it went as low as $86,000 dollars but before the end of the week, it recovered nicely. I am still positive on overall development and trading. The draw down is just a temporary as we are still cash flow positive. Note: This is a cash flow of credits, not profits! I was managing open trades only, rolling SPX Iron Condor with today’s expiration down but it was not enough, so in the end I rolled the put spread into Monday’s expiration. Disclaimer: The list above is based on calculated fair value and 52wk high offset valuation. The values are subjective to our calculations and opinion and may differ from your own. If you decide to trade or buy these stocks, do so on your own risk and do your own homework. The list is not our recommendation to you. I’m interested in your trading strategy, but have trouble following the table showing your weekly/monthly results. Specifically, what is the ‘Trading Income’, and are those numbers included in the ‘Net Liq’ calculation? Yes, these are included in the Net-liq. The trading income is premiums received/paid. So what you see, is when I sell options, I receive premiums. Then, in the “Trading Income” you will see it as a surplus. However, that open trade still has impact on the net-liq. 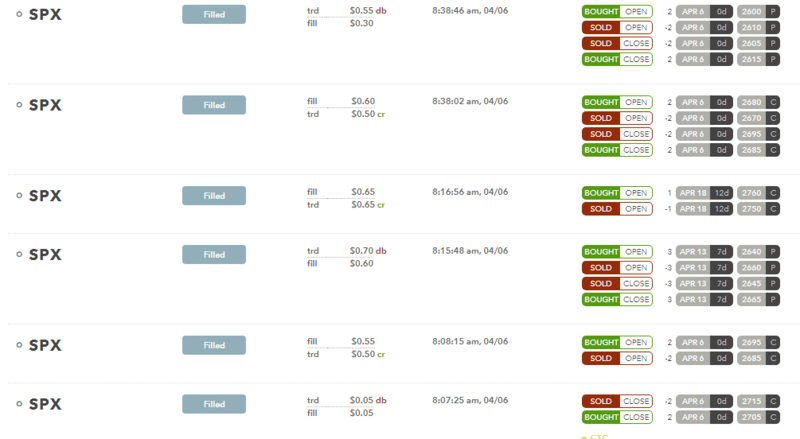 Partially due to bid/ask spread, volatility and direction of the trade. So if the volatility goes up, then the net-liq will go down although the open trade is safe and far OTM. However, as soon as the trade is closed then if I closed the trade for a debit, then in the “Trading Income” you will see a deficit and the net-liq will gradually go up. This is difficult to track as I keep trades open, rolling them, opening new trades, etc. 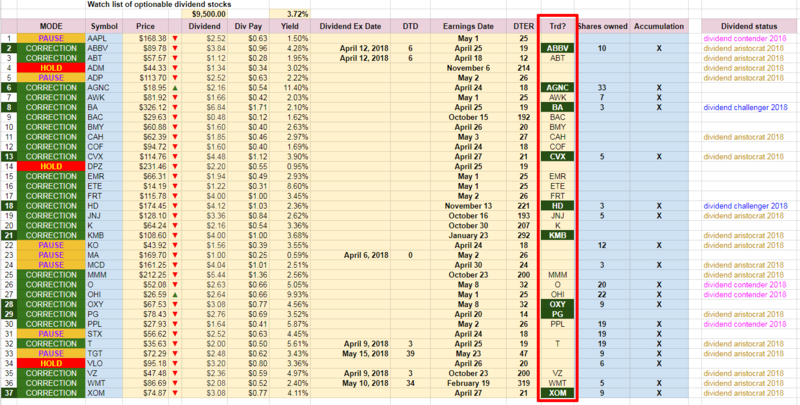 so at the end of each week I summarize how much money I received/paid to open/close the trades and what impact these trades have on the current account value (net-liq) if closed immediately at the end of the week (which of course I would not do as that would mean closing at a loss). So am I understanding correctly that your accounts are down, in total, over 20% so far this year? Not anymore. Today, as market rallied the net-liq is up again. It is down only on paper due to volatility of the open trades. If you want to trade options you must be prepared for these fluctuations in volatile markets. 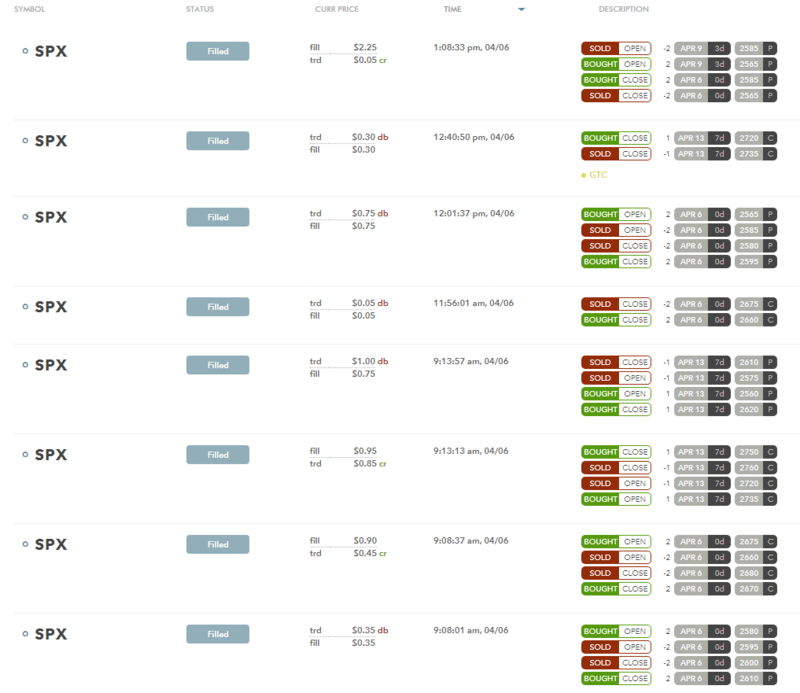 So, my accounts are down now on volatility yesterday, up again today, and probably even higher tomorrow.